Summer Jelly: Alternate layers of longans, raspberries and blueberries jelly and cream jelly on a Swiss roll soaked in compote sauce, served with rich double cream. Note: Thanks, Ming, for the beautiful board and table mats. What a sweetheart my friend Yoland is, to carry two punnets of raspberries all the way from Toronto for me! I set to work straightaway because the berries were getting mushy from being half-frozen. It must be cold already in Coldland. I was watching the BBC interview with Zaha Hadid a few weeks ago and something she said struck me, other than architecture being a very tough profession. She said again and again that she gets her design ideas from geometry. I'm totally not into geometry (because it sounds like math) but what Hadid said set me thinking about the Nick Munro moulds for the Royal Selangor Pewter Jelliriffic! 30-Day Challenge that I had just received. I imagined spirals and double helixes and swirls of colorful fruits set in clear jelly. One particular design that I had in mind was a spiral of clear jelly with tiny berries set against a white or opaque layer of jelly but that would be too difficult to make. I wanted to use local fruits but couldn't think of any whole tropical fruits as small as berries except for longans. This was a really, really difficult jelly to do, probably the hardest so far. I started with the wrong choice of gelling agent. I wanted a summer pudding-like jelly with cream mousse (made with gelatine) but I couldn't get the mousse layer to stick to the konyakku layer. Twice. I uploaded the photos last night and was hoping to go to bed early for once this month but the jelly looked even more cloudy in the photos. I decided less than two hours before the deadline last night to post my other jelly, the Traffic Cone. I thought of the other 9 people in the same fix as me and wondered if they were struggling too. This is not quite what I signed up for. I need to reclaim my life. I don't take calls, haven't time for a haircut or even meet with my friends. Hub asked if we are still married. I re-did the jelly three times today, experimenting with different gelling agents. That makes a total of five times although not everytime was a full jelly. It was incredibly frustrating. The raspberry at the tip would get stuck and the whole jelly when turned out would not have a tip. One jelly fell apart when turned out, the different layers slipping away easily because of the slope. Then, unbelievably, I ran out of gelatine powder and all cake ingredients shops were closed because it's Sunday. Because of the heat and the time and distance traveled, the raspberries were so mushy that they were bleeding into the clear jelly. When I turned the final jelly out, my heart fell. Because dipping the jelly mould into hot water always melts my gelatine jellies and also because the soft raspberry tip got stuck a couple of times, I decided to use a small spatula to dig the jelly out. That resulted in the uneven surface on the jelly, ruining the clear look I was trying to achieve. Totally a Murphy's Law day. How did the jelly taste? Well, you'll have to make it yourself to know. I ate summer pudding for the first time last year at Tina's, and it just blew me away. For this jelly, I used a store-bought Swiss roll (jelly roll) instead of bread because I didn't want to get a loaf of white bread just to use one slice but if I were making lots of these jellies, I'd get a loaf. The Swiss roll was too fine and mushy when soaked. I served the jelly with lots of thickened cream (the kind for whipping) but double cream would've made it even more luscious. Tangy berries, sweet longans, smooth jelly, fruity sauce and lots of sinful cream--this is one of the best jellies ever. Yes, I would serve this to Gordon Ramsey, I would. In my poached pear jelly post, I used a bowl to tilt the mould but I found that the mould'll rock easily. A piece of styrofoam (from a wedding anniversary cake I made for V & L!) works better. 1. Mix the sugar with the gelatine powder and scatter over the water in a pot. Heat, stirring all the time until sugar and powder are dissolved. Remove from fire. 2. Rinse and stand a Nick Munro mould in a mug. Spoon in 2 tsp of the jelly, drop a raspberry and one or two blueberries in. Wait until almost set to add the next layer. There will be enough for the next three layers but you need to re-heat the unused jelly thoroughly before using. 3. Mix gelatine powder and sugar, scatter over the water in a pot and heat, stirring, until all sugar and powder are dissolved. Remove from fire and add the evaporated milk and/or cream. 4. 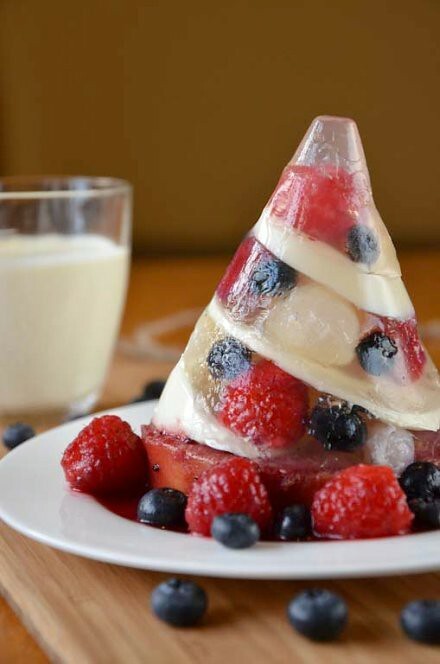 Alternate the layers, clear and cream, arranging the fruits in the clear layer. If making slanted layers, use a piece of styrofoam to stand the mould in. Remember to pour hot (but not so hot that it melts the previous jelly) jelly liquid onto the previous layer so that the layers will stick together. Put jelly into the fridge to chill and work on the sauce. Put the 2/3 cup mixed berries (I used St Dalfour's blueberry preserves instead of fresh blueberries) into a small pot with 1 to 2 T caster sugar (to taste) and 2 to 3 tbsp water. Stir, pressing the berries with a fork to let out the juices. Let berries cook for about 3 minutes. Remove and sieve into a small bowl. 5. Cut the piece of white bread to the size of the mould, place on a serving plate and soak it thoroughly with the berry sauce. 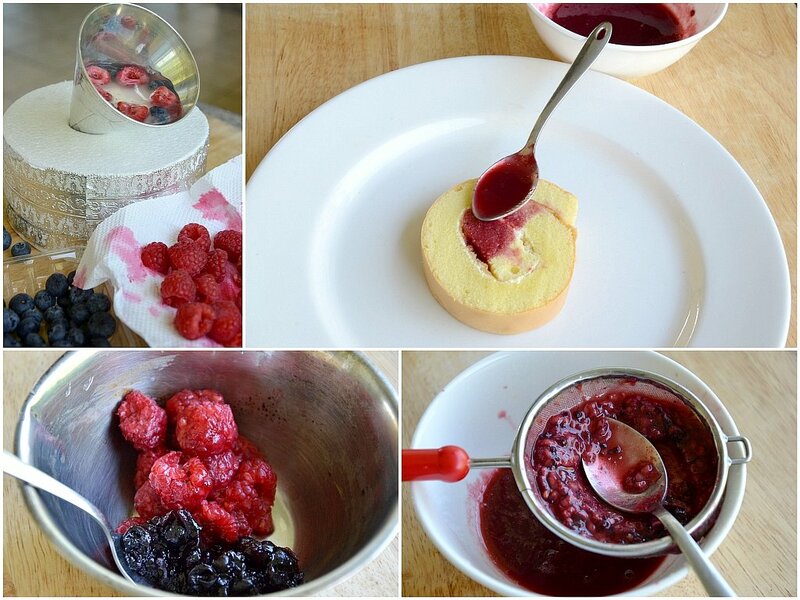 Place the jelly on top of the bread and serve very chilled with cream, extra sauce and berries. Note: If you are making a big lot, it's best to cook the jelly layers one by one so that the clear layers will look clearer and smoother. p.s. Almond Tofu Part 2 some other day. Terri, you have outdone yourself this time! This looks fantastic and I really admire your tenacity! It is so pretty! this is pretty!!! especially for a hot and humid weather in kk now. i wish i can have it for my supper right now. you really have the passion and creative ideas. this is my second best jelly post from u. Your photography is incredible! Ah yes, the competition. I can't believe all of you had to come up with one creation EVERYDAY. It's insane. No wonder you don't have a life! BTW, where do I vote? Such a beautiful jelly! Love it! Terri, so so so beautiful, i just love to admire it though i won't make it cos of the difficult level. Love it. Bring it on! Think about it though, we are all so proud of you that you are sticking to it till the end. AND at the end, you can say, against all odds;jelly not setting, falling out from the fridge, forgetting this and that and not having time for yourself - YOU DID IT! and as a wise one said "And soon this will pass"
this is beautiful mama! looks like a lot of work...i'm so proud of you! ...and auntie yolly, you rock! Lovely jelly and sound refreshing. T! your designs are getting more and more sophisticated!! :) looks lovely! this made me go WOW! the slanting layers, the colours, absolutely stunning! I got a chance to taste it. had a good dream last night, as well. Thanks , Terri. yolly. Ive done my vote..It Sakura jelly!! and today Jelly aswell..oooo im drooling..it look so yummy!! If u don win this I think there is something fishy. Nee. You've such lovely showy 'outside the box' ideas Terri! Kudos on Summer Jelly! 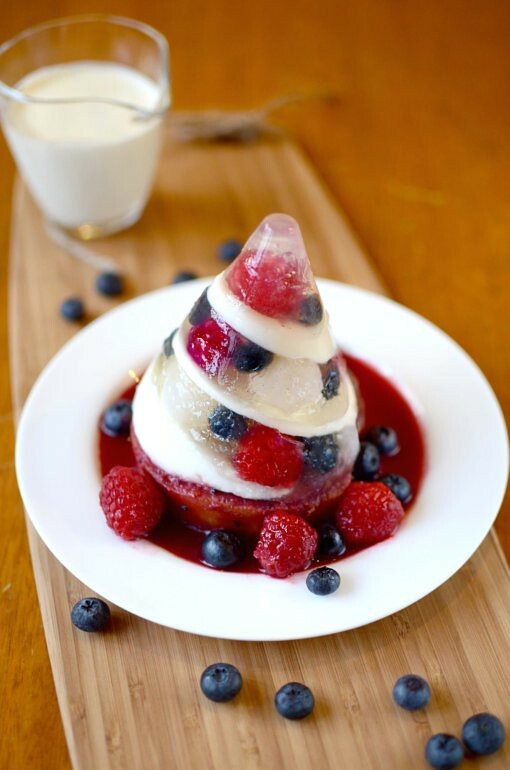 What creativity and imagination, Terri; taking summer pudding (jelly) to a whole new level! So refreshing and perfect for a hot summer day (like today). Looks stunning and sophisticated too. You've outdone yourself, outdone the competitors. You have separated yourself from the competition. Might as well they announce you the winner now. The photography is breathtaking. This has unearthed a treasure of more talents than you could ever have thought you had, thanks to the Royal Selangor challenge. what I would suggest though is that you print this as a recipe book, so friends can give to their friends as a present. I would love to have a dozen to give to friends and relatives. Well done Terri, well done Royal Selangor. Love ALL your creations! You are superb! Superb! What a lot of work. Well done.